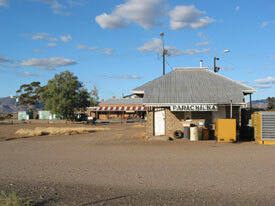 After more than 4 days in Broken Hill, I was ready for the big city. And in South Australia, the big city is Adelaide. 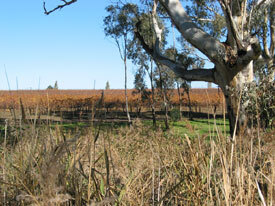 There is a lot to see in South Australia, which is the driest state in Australia, which is largely a dry country. A large land mass, combined with relatively few large mountains, means that the continent is one of the Earth's driest. I didn't find Adelaide to be all that interesting. 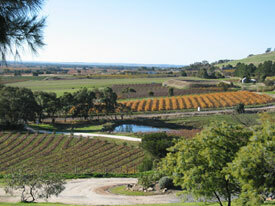 The "city of churches" has few nice sights, but the main reason I went was to rest up and use it as a base to see the Barossa Valley, one of the world's finest wine growing regions. 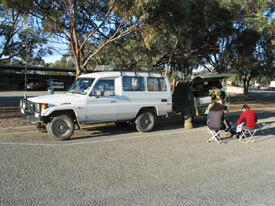 About this time, I decided to continue west until I got to Perth. 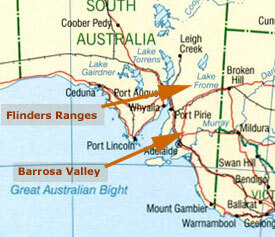 The Indian Pacific runs to Adelaide and on through Port Augusta and the Nullarbor on its way to the Indian Ocean. I caught a bus up to Port Augusta, where I was picked up for a 4WD tour of the Flinders Ranges, the remains of ancient mountains (~550 million years old), and an evening in Quorn, a wonderfully quaint outback town. Fabulous churches. 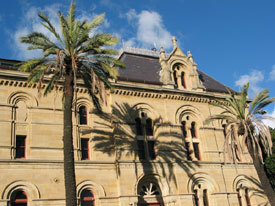 Whatever else you say about it, Adelaide is a beautiful city, one lined with random palms and a variety of architecture that really works well together. 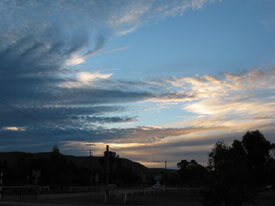 This shot was taken outside the South Australia Museum. This is a perfect example of that mixing and matching of buildings. 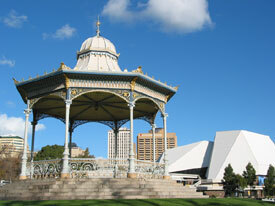 The Torrens River, which runs through downtown Adelaide, is lined with gazebos as old as the city and modern buildings (right), some still under construction. 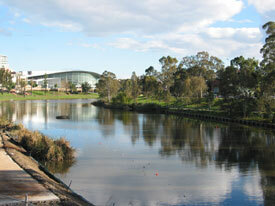 Adelaide's entire city center is ringed in green parks and natural spaces, with the Torrens River forming the northern boundary. 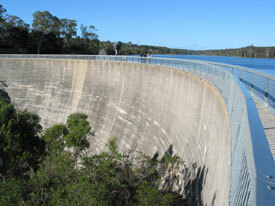 On the way up to the Barossa Valley, we stopped at one of the largest reservoirs in South Australia, which features the Whispering Wall. Yes, it really works. The tour group had an entire conversation speaking with normal voices with the parties more than 150 meters away from one another. I thought this was a nice scene and spent about 10 minutes trying to frame this shot. 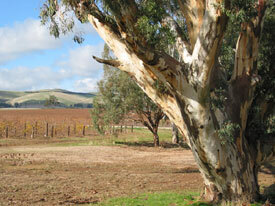 I liked the contrast of the paperbark tree and the vineyards and the rolling hills in the distance. The fact that this happened in the middle of the wine tasting portion of the tour was purely coincidence. Here I am at the next winery, standing next to a new/old tower designed to make the whole place like it wasn't built 4 years ago. Needless to say, the facade didn't work. 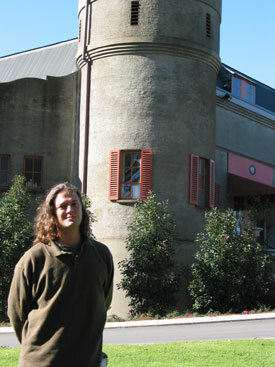 This is the other side of that tower, located at the Richmond Grove tasting room. 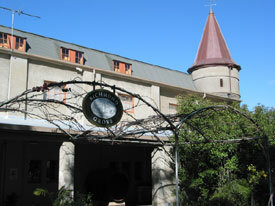 We had lunch at Richmond Grove, a wonderful Aussie bar-b-que next to vineyards and a stream. 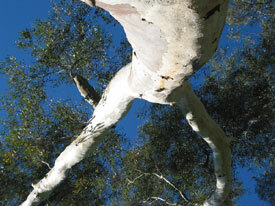 I thought this tree looked like a man when viewed upside down. See the legs at the bottom and the torso at the top? 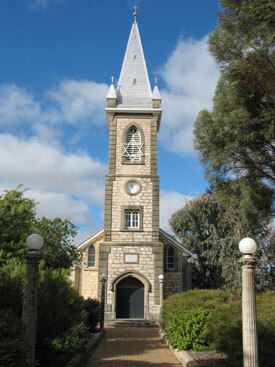 A beautiful church in Tanunda, located in the heart of the Barossa Valley. 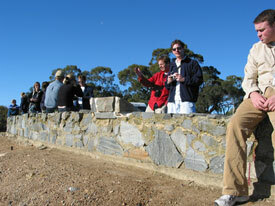 The wine tour group took a little pause before heading home. 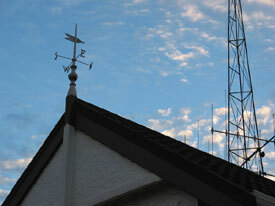 A house with a weathervane in Quorn. 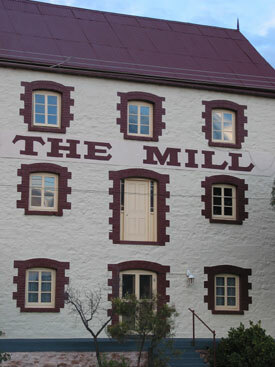 Umm, the old mill in Quorn. 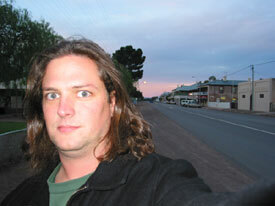 An autophoto taken on the main road through Quorn as the sun was going down. 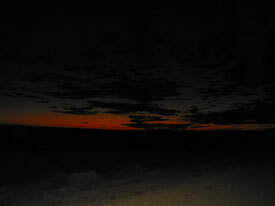 Later on, the deep reds really come out on the horizon. When settlers first started setting up shop in the Flinders Ranges, they founded large sheep and cattle ranches and built houses using the materials available. 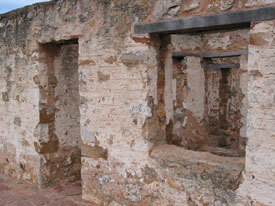 Today, all that remains of many of these homesteads is some crumbled ruins. 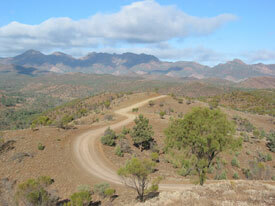 The Flinders Ranges are usually pretty dry but in a different way from the area around Broken Hill. Much of the scenery reminded me of New Mexico, harsh in many places but also pleasant. 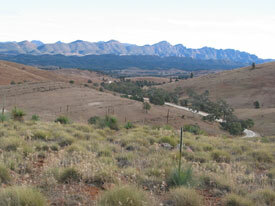 The jewel in the Flinders Ranges crown is the Wilpena Pound, a unique geological formation made up of ancient rocks, some twisted to point at the sky after eons of seismic activity. Inside the Pound, a road snakes along the stream. Some of the best ranch land in the area is located here, and the constant presence of water means that animals are abundant. 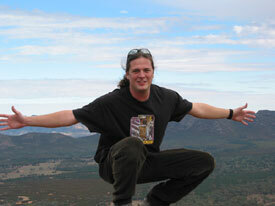 My group climbed the Pound and stood at the top near Mount Ohlssen Bagge. 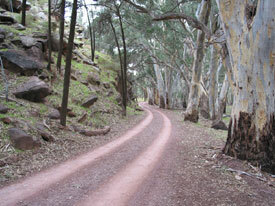 The road out of Wilpena Pound runs through a small opening in the natural enclosure. This is the greenest place around, thanks to the occasional flooding. 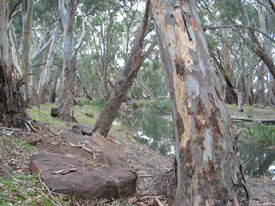 The stream beside the road leading out of Wilpena Pound. While we were in the Pound, our guide Daniel was stung by a bee. As Daniel was allergic to bee stings, this was a very serious problem. We rushed back the 100+ kilometers to the nearest hospital. By the time we arrived, he was swollen and red, clearly suffering. While we waited to find out what happened next, we hung out in the hospital's parking lot. Thankfully, Paul, the new owner of the Wallaby Tracks Adventure Tours, appeared and continued the tour, while Daniel got to spend a night in the hospital. 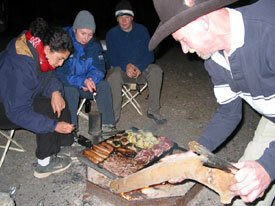 We quickly headed out of town and made camp. Next up, the big feed. 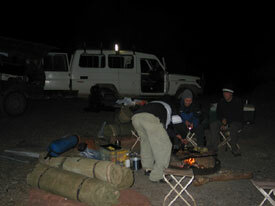 We really spent the night under the stars, in all of its glory. The bedrolls in the left corner of this photo are our "swags," which are really a kind of outer covering for your sleeping bag or blankets to keep you warm in the near freezing temperatures. 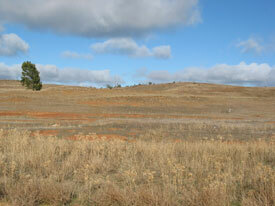 Can you spot the kangaroos in the photo? Having trouble? Click on the photo and then try to find them. 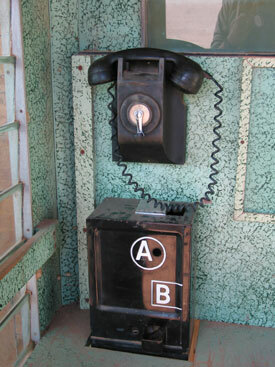 Ah, the bush crank payphone. Where have you been all my life? Actually, the group couldn't decide if this was still a working phone or not. We couldn't get it to pick up no matter how hard we cranked, but maybe you have to put a penny in first. 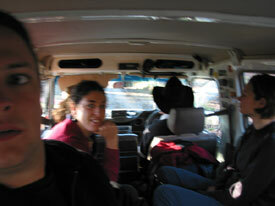 An action shot of the 4WD in motion, featuring the group and Paul (and his hat) driving. Plenty of room (and windows) for everyone. 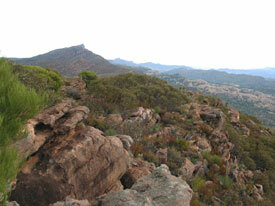 The entire Flinders Ranges area is full of Aboriginal heritage. 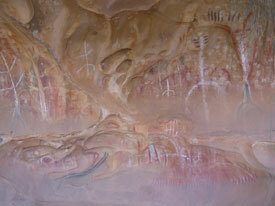 We took in a small part of it when we hiked out to a cave painting area that was used for male initiations as late as the 1940s. The 3-legged figures symbolize men, and the individual notches supposedly signify the number of people at a particular initiation. 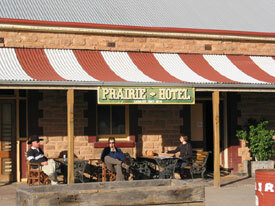 Chillin at the Prairie Hotel. 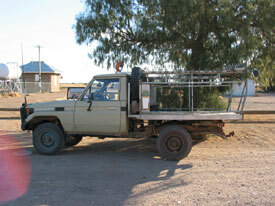 While we hung out at the Prairie Hotel, a dude in a truck converted to handle kangaroo carcasses rolled up. Kath and I watched a TV show about the "roo shooters" that hunt at night and hang the dead roos on the pegs that line this truck.